This highly concentrated cream moisturizes and calms sensitive skin. 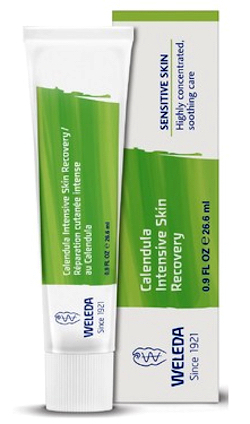 Calendula Cream is formulated with a high percentage of biodynamically grown calendula, handpicked from Weleda's gardens in Germany. This cream is free of GMOs, synthetic preservatives, fragrances, colorants and raw materials derived from petroleum. Ingredients: Sesamum Indicum (Sesame) Seed Oil, Water (Aqua), Lanolin, Calendula Officinalis (Calendula) Extract, Beeswax (Cera Flava), Lanolin Alcohol. Something has been causing me to get hives every few months for about a year and half. I never had them in my life before. Your Reishi tea has been the single most important herb to boost my immune system for overcoming the hives, quicker each time. Also, topically I use your peppermint essential oil or calendula cream for relief of the rash, which is decreasing with each subsequent bout of hives.